I received an entry in the rafflecopter in order to post this. All opinions expressed are my own honest opinions. For more information please check my Disclosure Statement. Our giveaways are in no way sponsored or promoted by Facebook. 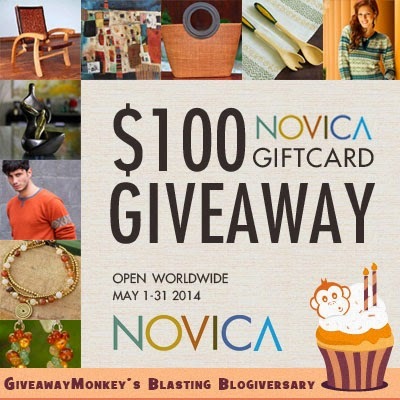 I would love to win this giftcard!!!!!!!!!!!!! I'd get the Earthly Wonderland Hand-woven Cotton and Leather Folding Wristlet Bag. Hello, I would get the Crazy Summer Mexican Leather Shoulder Bag. Thanks for a great giveaway! I like the Hand Embroidered White Cotton Sheath, the Black Cotton Poplin Pants with Pockets. I like the Artisan Crafted Palm Wood Earrings - Forest Leaves. I love the Holy Birth nativity. Where do I begin? 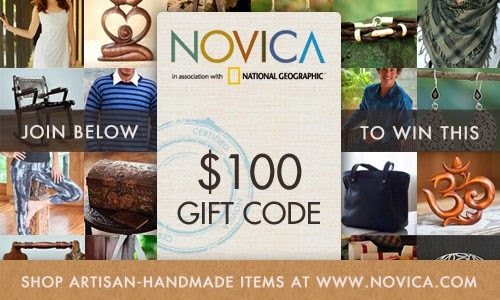 Currently, there are over 650 items on my Novica Wish List and I'm sure I've made at least 25 purchases over the years both for US for wonderful gifts! Right now, if I had a bit of pocket money available I would seriously consider buying a necklace and /or earrings by Nareerat, Sasina, Danai, Anusara, Busarin or Khun Boom (all of Thailand.) Or maybe another exquisite wood sculpture from Wayan Rendah or Nyoman Karsa (Bali/Java) or John Barrow (Andes.) We also love the (recycled) metal sculptures by awesome J Blas or Marco Polo (!) in Mexico. Thank you for the VERY generous giveaway! I love the gold dipped flower necklaces!